In the Keck plan, an unmanned probe would snag a 25-foot-wide (7 meters) near-Earth asteroid, then haul it back to lunar orbit for future study and exploration. Its developers see the mission as a way for humanity to get a toehold beyond low-Earth orbit, allowing our species to hone techniques and acquire skills that manned missions to more distant destinations will require. 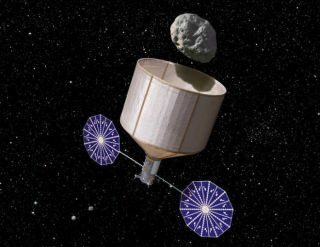 For example, the robotic mission would help develop the precision flying techniques demanded by a manned mission to a near-Earth asteroid. Further, study of the captured space rock could teach researchers how to efficiently extract water from asteroids — a resource that could be an off-Earth source of radiation shielding and rocket fuel for journeying spacecraft. "Extraction of propellants, bulk shielding and life support fluids from this first captured asteroid could jump-start an entire space-based industry," the Keck team writes. "Our space capabilities would finally have caught up with the speculative attractions of using space resources in situ." Up-close examination of a captured asteroid would also yield insights into the economic value of space rock resources and shed light on the best ways to deflect potentially dangerous asteroids away from Earth. Overall, the potential benefits of the mission are huge, the Keck team says. "Placing a NEA in lunar orbit would provide a new capability for human exploration not seen since Apollo," the report reads. "Such an achievement has the potential to inspire a nation. It would be mankind’s first attempt at modifying the heavens to enable the permanent settlement of humans in space." Human exploration of deep space beyond the moon is a NASA priority. In 2010, President Barack Obama directed the agency to get astronauts to a near-Earth asteroid by 2025, then on to the vicinity of the Red Planet by the mid-2030s. To make all of this happen, NASA is developing a crew capsule called Orion and a huge rocket known as the Space Launch System. The Orion-SLS combo is slated to begin flying crews by 2021. The first unmanned Orion test flight is expected in 2017. The space agency is also developing a new Space Exploration Vehicle for astronauts bound to explore a near-Earth asteroid. A prototype of the new vehicle, which could feature a rocket sled and "pogo stick" device for docking with an asteroid, coul dbe tested at the International Space Station in 2017, project officials have said.